Social Media Group Dynamics: The Passive Aggressive Putz! 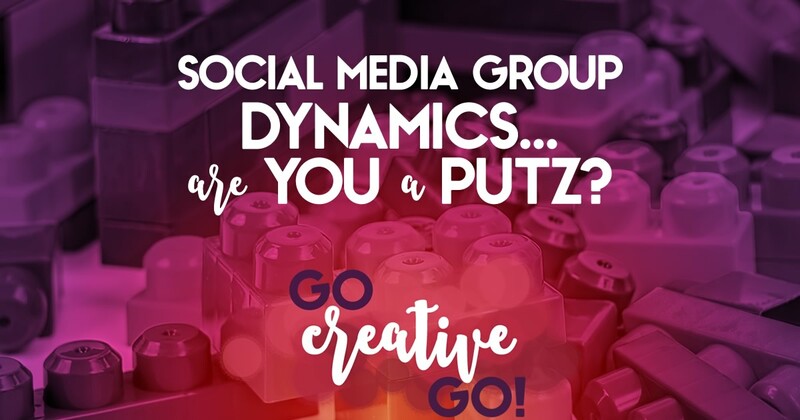 Social Media Group Dynamics: Don’t Be The Passive Aggressive Putz! Are you part of a Facebook group or a Google+ community? They can be a fantastic resource when they’re full of like minded individuals all intent upon bettering the experience of all involved in the group. However, whenever you get a group together you’re going to face occasional upset and some snarky comments when one or more group members believe that other group members aren’t holding up their end of the bargain. She’s Not Doing It Right! Inevitably, when a group’s intent is to increase the social media visibility of its members, you’ll find that a handful of that membership don’t necessarily take the idea of reciprocity to heart. And, again, inevitable, you’re going to have some well meaning group members chiming in that said lack of reciprocity isn’t fair. And they’re right. But it’s the way they go about “voicing” these opinions that is the meat of this article. It’s hard enough for a group owner and moderator to deal with the bad habits of spammers and those who don’t read the groups rules, regulations and terms of service before plugging themselves and their services at every opportunity. They’ve created these groups with the greater good of all members in mind and they’re putting in a lot of time and effort to make the group work, and work well, for all involved. So, when passive aggressive Paulette starts whining about “someone” who is liking her post rather than sharing it, it’s just another reminder to the group owner that he/she is dealing with the infantile and illiterate. We Don’t All HAVE TO Share Your Shizz! As stated previously, many a Facebook group is created with the intent to increase the visibility of its membership. Some group members, incorrectly, immediately assume that this intent to increase visibility mean all of their shizz will get shared by each and every other member of the group. Generally speaking, the group owner sets the rules on how the sharing activity should roll out. Usually, when you hope to share your own goodies, you’re expected to share two to three items from the group. Two to three, not every flipping item. We get to be choosy. Maybe your items don’t fit in with our niche. Maybe we don’t think the content you’re sharing is as valuable as you believe it to be. Whatever the case may be, sometimes your stuff just isn’t going to make the cut. Whining that you share every group member submission, but don’t see the same sharing of your own submissions, doesn’t make anyone want to share your shizz! It shows that you aren’t very discerning and you’re only looking for shares for sharing’s sake, rather than shares that add value to your business and your audience. Positive In Public, Passive Aggressive In Private! If you’ve ever been part of a structured networking group like BNI or Powercore, you know this mantra. And it’s just common sense. For the love of Pete! Pretty puh-leeze cease the passive aggressive whining and complaining when you believe a social media group member is failing to play by the rules. You don’t look like you’re looking out for the group in these instances. You simply look like a whiner. Positive in public, but take the negative to the group leader via a private message or email. Let them deal with any infractions in the way they see fit. It’s their group. You don’t need to be the passive aggressive police. Your opinions matter, but not when they take away from the collective group experience. http://www.gocreativego.com/wp-content/uploads/2015/06/GCG-pinnable-group-putz.jpg 1080 735 Mallie Hart http://www.gocreativego.com/wp-content/uploads/2016/07/GCG-sitelogo-new.png Mallie Hart2015-06-30 07:53:322016-10-07 16:33:10Social Media Group Dynamics: Don't Be The Passive Aggressive Putz!